Oleander (Nerium oleander): growing, planting, caring. An evergreen shrub that flowers all summer. Depending on the variety, it can more or less tolerate frost, but it's not against being planted in a (big) pot! Oleander is a Mediterranean plant and an Atlantic coast plant: it needs sun and heat to prosper in well-drained, rich earth with lye! Anywhere that runs the risk of frost and depending on the variety, it would do best planted in a pot and sheltered in winter in 40°-50°F temperatures with light, reduced watering, and no fertilizer. 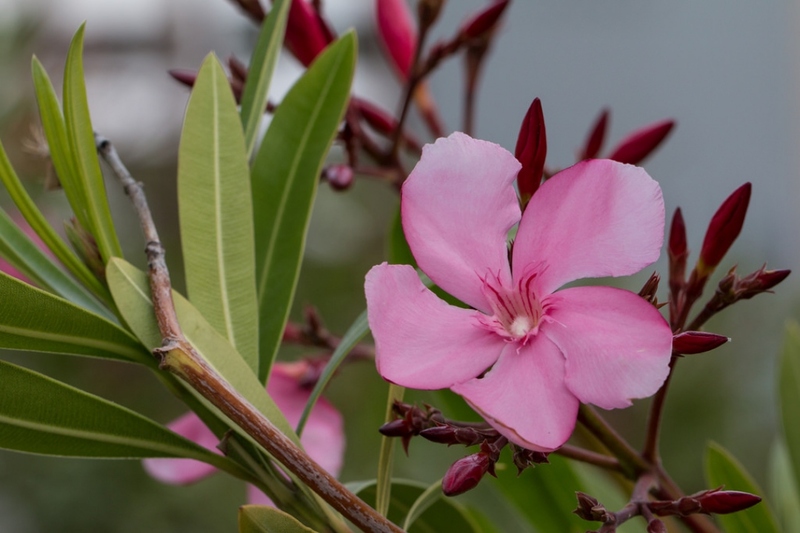 The oleander is one of many plants called "laurels", because of their tough, shiny, elliptical leaves. However, it's completely unrelated to the Laurus genus! 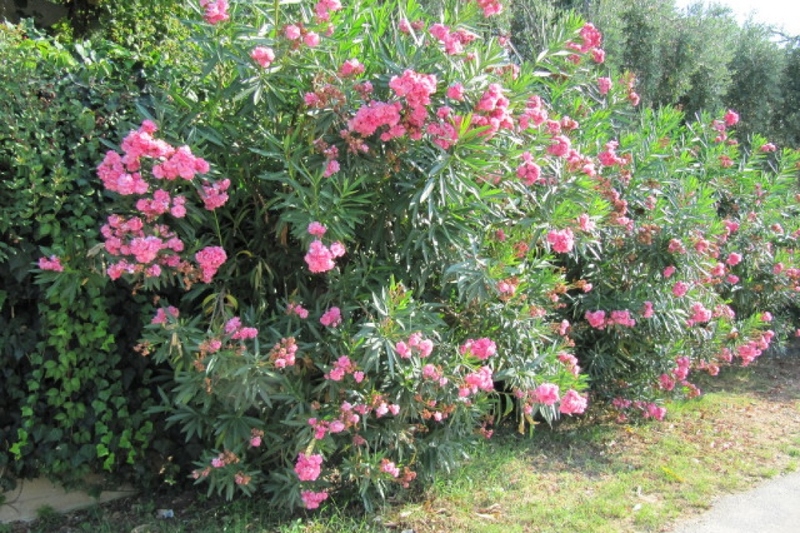 The oleander is a shrub or small tree measuring from 2 to 4 m in height. It's flowers may be white, yellow, orange, red or various shades of pink, and either single, double or triple. They bloom in summer, from June to October, and they have long, dark, evergreen leaves. 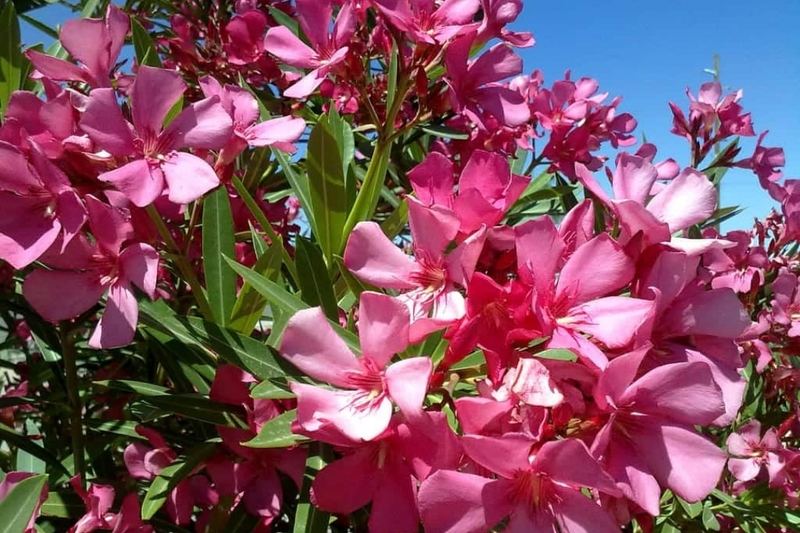 Plant your oleander from October to March, outside of freezing periods, as winter planting allows for better root development. Choose a sunny location that is sheltered from winds if possible! 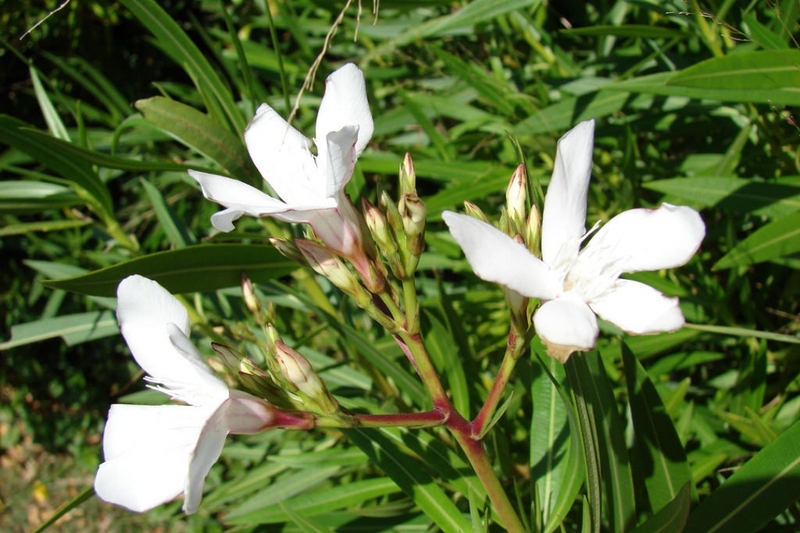 Oleander graciously accepts all kinds of soil, provided it's well drained, and eventually enriched with potassium. Don't hestiate to add sand and stones to the earth to help with drainage! Before planting, trim damaged roots and branches to balance the root volume and the above ground volume. Plant in a hole at least two times bigger than the root ball. Spray water on the roots before planting. This will greatly improve the chances of growth, no matter the conditions. Plant while taking care not to bury the plant's root collar. Form a basin around the plant's base, which will be used for watering the first months. Form a basin around the base, which will be used for watering the first months by tamping down the soil around the roots. Don't hesitate to use all of your body weight! Water until the planting basin is full — at least two watering cans! Two scenarios, depending on whether your plants are potted or in open soil! Prune the branches of your open soil oleanders at the very start of spring to approximately 1/3rd of their length. You may cut them down as low as 50 cm above the earth without any problems, as oleanders don't fear pruning! If some branches have blackened during winter, they suffered from frost — remove the entire section, as it will not grow back. Prune your potted plants before bringing your pots in to shelter from the frost — cut back the new year's stems half their length to keep an attractive, compact silhouette. Water thoroughly the first few weeks. Beyond the first year, you shouldn't need to worry about watering any more, except in the event of serious drought. 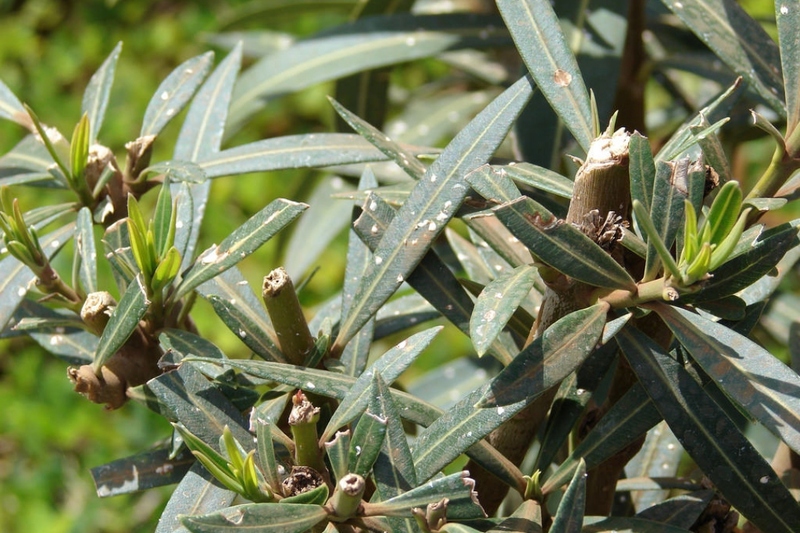 If your oleander is potted, continue to keep an eye on it. Water copiously but infrequently to encourage the root system to seek water deep underground. It's therefore suitable to water until the planting basin is full and only empties slowly. If you live in a region where it freezes, and if your oleander is susceptible to frost, protect it by mulching the base of the plant and covering it with a winter veil. Remember, even though some varieties can resist temperatures as low as -15°, young plants are still fairly fragile. Bring your potted oleanders inside for winter, in a well-lit, cool room, between 5°C and 10°C. Reduce watering, and don't add any fertilizer! Take advantage of this time to prune your plants, if you haven't already! Oleanders are moderately demanding plants. They have particular need of potassium to develop beautiful foliage! Other basic elements — especialy nitrogen and phosphorous — will help early development in young plants. They will also help support the vegetation of oleanders in garden planters, typically imprisonned by the limited volume. Have you noticed your oleander isn't growing anymore, or that it's flower buds have stopped developing, or it's staying small and weak...? Sounds a lot like it's suffering from nutriet deficiency! Add compost in spring, after hoeing and leveling the earth. Failing that, add a quick release fertilizer with a low nitrogen content — a fertilizer "for tomatoes", for example. To add potassium, spread wood ash or "plant" bits of banana skin around the foot of the plant!